Catheter patency is vital for the delivery of hemodialysis and effective, long-term vascular access for patients with end-stage renal disease. Tunneled catheter thrombosis, as a result of venous thrombosis or the formation of fibrin sheaths, is a leading cause of catheter failure. Thrombosis can occur when the distal tip of the catheter comes in contact with the vessel wall, which can lead to vessel wall injury and fibrin sheath formation. The tip designs of many available long-term hemodialysis catheters on the market today allow for the tip of the catheter to come in contact with the vessel wall. The CentrosFLO represents an innovative approach to the design of long-term hemodialysis catheters. The self-centering, curved-tip catheter has a greater separation between the arterial and venous tips compared to a symmetric-tip catheter. Its design is intended to optimize catheter patency, and to reduce fibrin sheath formation, thrombosis and vessel wall occlusions. This unique tip design keeps the tips of the catheter centered in the vessel and away from the vessel wall reducing vessel wall trauma. An independent retrospective study1 conducted by a vascular access center showed 94.7% patency in the CentrosFLO catheter versus the competitor’s catheter, which had a patency rate of only 75% at 3 months. 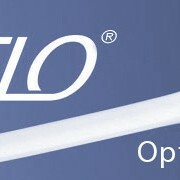 For more information about the CentrosFLO Long-Term Hemodialysis catheter, visit the CentrosFLO product web page. I’m pleased to announce that the PreludeEASE hydrophilic sheath introducer has received the CE mark and is now available for sale in Europe. 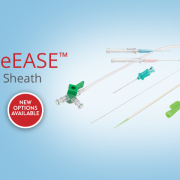 The PreludeEASE hydrophilic sheath introducer has been designed with the performance you need to achieve radial access with ease. Coated to the tip of the sheath to facilitate easy insertion and removal. Excellent transitions from dilator to wire and from sheath to dilator for smooth and easy insertion that can enhance patient comfort. 4F-7F and 7, 11, 16, and 23 cm lengths for a variety of patient sizes and clinical needs. PreludeEASE hydrophilic sheath introducers are a great complement to our growing line of products designed to support radial access procedures from start to finish. To learn how you can achieve radial access with ease, contact a Merit Medical Sales Representative. PreludeEASE is not 510(k) cleared for sale in the United States.